Saban's Power Rangers Laser Tag Course & more! 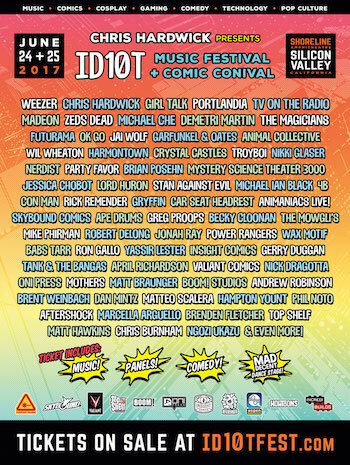 Los Angeles, CA (June 19, 2017) — ID10T Music Festival & Comic Conival has revealed its full weekend schedule of music, comedy sets, panels and more. 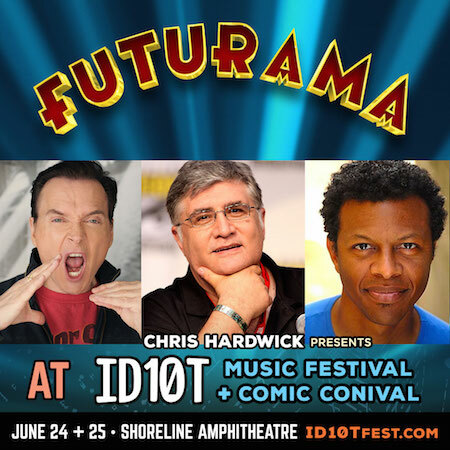 Con Man and Futurama have been added to the impressive lineup of confirmed panels alongside Portlandia, Mystery Science Theater 3000, Harmontown, Animaniacs LIVE!, The Magicians, and Stan Against Evil. A number of intimate themed panels and podcasts have also been announced, including live Nerdist Podcast tapings, panels from Valiant Entertainment and AfterShock, tech panel Robots Among Us: Fantasy vs. Reality, and many, many more. 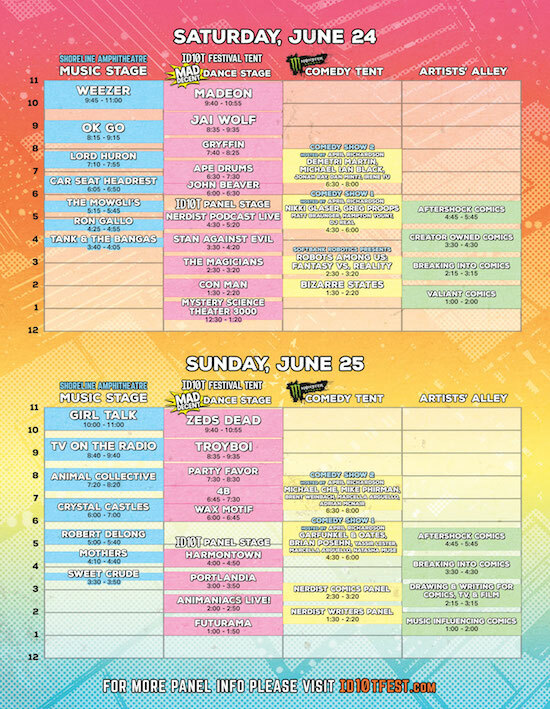 The groundbreaking, first of its kind event created and hosted by Chris Hardwick, will take over the Shoreline Amphitheatre and surrounding grounds in Mountain View, CA on Saturday, June 24th and Sunday, June 25th. 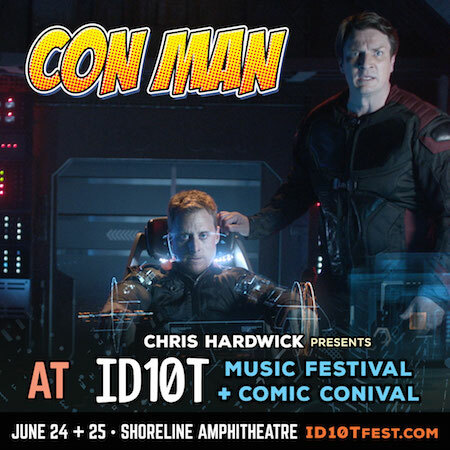 Con Man, featuring guests Nathan Fillion and Alan Tudyk, moderated by Chris Hardwick. A decade has passed since Wray Nerely (Alan Tudyk) was an actor on the hit (well, cult hit) sci-fi show, Spectrum. Wray's career has stalled in the vacuum of space while his best friend and former co-star, Jack Moore's (Nathan Fillion), has hit warp speed. Aided by his truly certifiable convention booker, Bobbie (Mindy Sterling), Wray navigates the sci-fi convention circuit alongside a host of colorful who's-whos and has-beens. He struggles with the trappings of a stagnant career, the adoration of a rabid fanbase, and an industry that only sees him as a quirky spaceship pilot. Futurama, featuring guests Billy West, Maurice LaMarche, and Phil LaMarr. Hatched from Matt Groening's brain, Futurama follows pizza guy Philip J. Fry (voiced by Billy West), who reawakens in 31st century New New York after a cryonics lab accident. Now part of the Planet Express delivery crew, Fry travels to the farthest reaches of the universe with his robot buddy Bender and cyclopsian love interest Leela, discovering freaky mutants, intergalactic conspiracies and other strange stuff. The panel will feature West (Philip J. Fry), Maurice LaMarche (Morbo) and Phil LaMarr (Hermes Conrad). 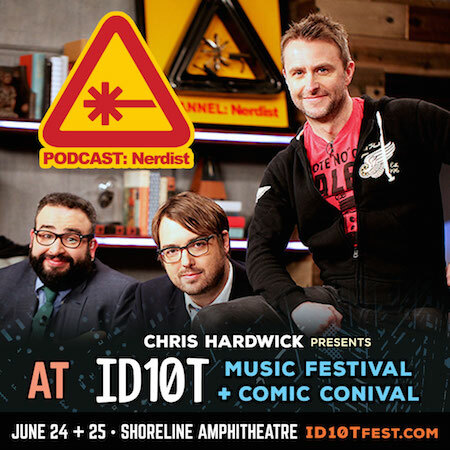 Join Chris Hardwick, Jonah Ray, and Matt Mira for a live recording of a Hostful Nerdist Podcast! Previously announced panels include IFC's Emmy nominated comedy Portlandia, featuring guests Fred Armisen and Carrie Brownstein, moderated by Chris Hardwick; award-winning comedy television series Mystery Science Theater 3000, featuring guests Jonah Ray, Hampton Yount, and Rebecca Hanson, moderated by Wil Wheaton; SYFY's The Magicians featuring guests John McNamara, Sera Gable, Olivia Taylor Dudley, Hale Appleman, Arjun Gupta, and Summer Bishil, moderated by Chris Hardwick; Animaniacs Live! featuring original cast members Rob Paulsen (Yakko, Pinky from Pinky and the Brain), Maurice LaMarche (Brain from Pinky and the Brain), and Emmy-award winning composer Randy Rogel, moderated by Chris Hardwick; Harmontown, featuring guests Dan Harmon (Community, Rick & Morty), Jeff B. Davis (Whose Line is it Anyway), and Spencer Crittenden (HarmonQuest), plus special guests; and IFC's original horror comedy series Stan Against Evil, featuring guests John C McGinley (Scrubs), Janet Varney (You're the Worst), and Dana Gould (The Simpsons, Parks and Recreation), moderated by Jessica Chobot. Saturday guests include Phil Hester, Justin Greenwood, Brent Schoonover, Robert Wilson, and Morgan Beem, moderated by Matt Hawkins. Sunday guests include Nick Dragotta, Garry Brown, Robert Wilson, Jai Nitz, and Gerry Duggan, moderated by Jarrett Melendez. Ever wonder what it takes to break into the comic industry? Let these veterans tell you how they did it and how you can too! Featuring guests Becky Cloonan, Ivan Brandon, Brenden Fletcher, and Andy Kuhn, moderated by Matt Horak. Learn how music has inspired, motivated and influenced comic book stories and art from some of today's leading creators! Featuring guests Mike Costa, Tom Fowler, Mark Sable, Blair Shedd, and JK Woodward, moderated by Jarrett Melendez. Oftentimes the comic book world crosses over into the land of television and film. Come see how these creators have navigated that transition successfully. Featuring guests Rick Remender, Gerry Duggan, Nick Dragotta, Matteo Scalera, Farel Dalrymple, Ivan Brandon, and Justin Jordan, moderated by Ben Blacker. Featuring the Babyteeth team of Donny Cates and Garry Brown, moderated by AfterShock. Jump into the largest independent superhero universe in comics right here with a guided tour through the foundations and future of Valiant's most acclaimed series! From X-O Manowar and Faith, to Shadowman, Ninjak, Harbinger, Quantum and Woody, and beyond, discover where to start and what's coming next for the award-winning comic book publisher that Buzzfeed calls, "a universe full of your new favorite superheroes!" With multiple new series kicking off this summer, don't miss your chance to see what's coming next for Valiant's biggest comic book icons with an all-new presentation packed with sneak peeks and exclusive artwork! Featuring guests Omar Abdelwahed (Head of Studio for SoftBank Robotics America), Alonso Martinez (Technical Director at Pixar Animation Studios), and more. Today we're embarking on a new industrial revolution led by emerging technology breakthroughs in fields of artificial intelligence, robotics, the Internet of Things, and autonomous vehicles. While we are still years away from a real-life C-3PO, robots are becoming an integral part of our lives. Come hear a panel of experts discuss how the burgeoning robotics industry is getting us closer to making C-3P0 less of a fantasy, and more of a reality. Walk away with a deeper understanding of how robotics already plays a role in our daily life, and how society will shift to become more comfortable with the idea of co-existing with robots and interacting with them on a deeper level. This panel will take a deep dive into how movies, books, art and entertainment have played a significant role in the development of today's robots, and how fantasy is becoming reality as social robots become more prolific and technologically advanced. Host Ben Blacker discusses the business and creative process of making comics with other comics creators. Come hear AfterShock Comics' Editor-in-Chief Mike Marts, Donny Cates, and Garry Brown talk about AfterShock's place in the world of creator owned comics. The Writers Panel series is an informal chat moderated by Ben Blacker (co-creator of the Thrilling Adventure Hour; writer for Supah Ninjas, Supernatural, among others) with professional writers about the process and business of writing. Tickets are still available for ID10T, and kids 10 and under are free with accompanying paid adult admission. With something sure to appeal to the whole family, Lionsgate, in partnership with Nerdist, will power a Laser Tag course themed to Saban's Power Rangers in celebration of the film's June 27 release on 4K Ultra HD, Blu-ray Combo Pack and DVD. Two teams of five players each will compete head to head, with surprises lurking around every corner. Just outside of the Laser Tag course, attendees can also look forward to giveaways, costumes from the film, demos of the Power Rangers: Legacy Wars mobile game, and a special appearance on Sunday by the Yellow Ranger and Blue Ranger themselves, Becky G and RJ Cyler! Don't forget to come dressed as your favorite Power Ranger for a chance to win some morphtastic prizes! Additionally, there will be table top gaming tournaments, a number of Toyota fan experiences (including a Cinderella-themed infinity photo booth, interactive beatbox, and live caricature station, to name a few), and much more! Doors open at 12:00 p.m. on both Saturday and Sunday. With panels running from 12:30 p.m. to 5:45 p.m., comedy from 4:30 p.m to 8:00 p.m., and music from 4:00 p.m to 11:00 p.m., attendees can expect a full day packed with entertainment, all in an outdoor setting. The full schedule for ID10T is as follows (subject to change). 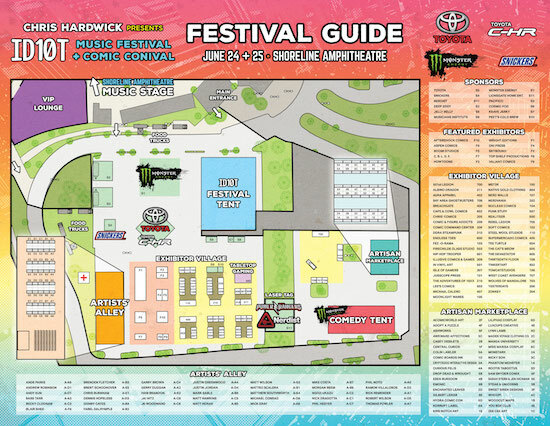 Information on tickets, pricing, VIP packages, and more is available at www.ID10TFest.com, along with a limited number of Fantastic Four-Packs with four tickets at only $55.00 each, plus fees. ID10T boasts a massive festival area directly adjacent to the amphitheatre's music stage. All tickets, including festival general admission, reserved seating and VIP, have free roaming access to the festival area, which includes the panels and music in the Festival Tent, Monster Energy Comedy Tent, and full exhibitor village.